Disclaimer: I was provided with an extremely generous selection of products from Door County Coffee & Tea Company in exchange for my honest review. All opinions are my own. I am an avid fan of coffee. I have been for years. My social media was covered with posts about coffee= life. I couldn't start the day without it. Then I gave it up. GASP! Horror! It wasn't because of the coffee itself, I realized that I was adding so many other things to it to make it drinkable that it wasn't really coffee that I loved at all, but flavored syrups and sugar and creamer. Time passed, and I thought that the desire for coffee would too. It did not. I started trying different brands, hoping to find one that I loved for the coffee itself with mixed results. Then I had a opportunity to try Door County Coffee & Tea Company. They sent an absolutely amazing selection of flavors in both pod and brew form, along with two gorgeous mugs. It's always a happy mail day when my Taste of Home Special Delivery Box arrives! The Spring box was particularly well-timed because we'd been having a stretch of cold, rainy weather, and it was an instant mood booster. I'm always amazed at the variety of kitchen items that are included, and despite having a good sized gadget collection, I rarely get an item that I already own. The big standout of this box was the rinse and store colander, since we are expecting another huge crop of blackberries this year. I'll definitely be picking up more of those! After I oohed and ahhed over all the goodies, I sat down with a cup of coffee and the cookbook and got to marking recipes I want to try. One of the ones that I put on the menu right away was the Big & Buttery Chocolate Chip Cookies. Spring has arrived and it's time to start looking forward to fresh produce and fresh springtime recipes! 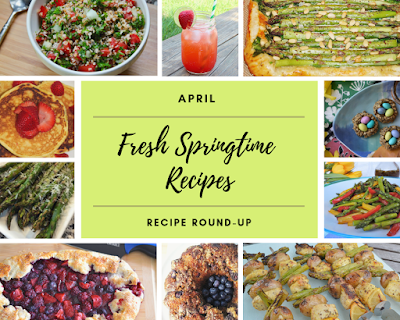 This month we have a lot of recipes for breakfast, sides and salads, main dishes, as well as desserts featuring a lot of early spring flavors like asparagus, eggs, peas, garlic, berries, lemon, and more. Keep reading to see all the recipes we have to help you plan out your April menu! When I think about spring in New England, the first thing that comes to mind is rhubarb. I patiently wait for the farms to put up their signs saying that it's available, then I go "stalk" up. Some gets used right away, but I freeze some for use throughout the year. The best way to do that is to chop it in 1/2" pieces and freeze them on a single layer on a rimmed cookie sheet. Once they are solid, move them to zip top bags or vacuum seal them.